Categorical eligibility makes it easier for households in need to receive automatic SNAP eligibility without going through cumbersome asset tests. Federal law requires states to confer “traditional” categorical eligibility, meaning households automatically qualify for SNAP if they receive cash assistance through Temporary Assistance for Needy Families (TANF), Supplemental Security Income (SSI), or a state assistance fund. However, states also have the option to extend “narrow categorical eligibility,” so that households receiving non-cash benefits through TANF are also automatically eligible. However, this Farm Bill draft would limit the type of non-cash benefits that confer categorical eligibility to “substantial services.” Considering the various categories of state TANF programming, this would no doubt reduce the number of households who can access SNAP more easily through categorical eligibility. More significantly, this draft would also force states to essentially eliminate the option for Broad Based Categorical Eligibility, which allows states to essentially waive asset testing so long as a family’s income is up to 200 percent Federal Poverty Line. Even though many states currently employ a more generous threshold for Broad Based Categorical Eligibility, the language in the bill would only allow states to employ this option for families earning up to 130 percent of the Federal Poverty Line (unless they have an elderly or disabled member). As a result of these changes, states will almost certainly have to implement expensive and time-consuming asset testing for low-income families who would be categorically eligible under current law. At a practical level, this means that liquid and illiquid assets like savings accounts and vehicles—which are critical for families to achieve economic mobility—could count against a household’s eligibility for food assistance. While the farm bill draft seeks to make some of these requirements more generous (for instance, allowing the exclusion of up to $7,000 in assets, rather than the current $2,000), it represents a major step backwards for states that had waived altogether these counterintuitive and costly restrictions. Similarly, the draft would no longer allow states to increase the SNAP benefit amount going to low-income families who receive heating and energy assistance if they don’t have an elderly or disabled household member. These changes will ultimately make it more cumbersome for families to apply for SNAP benefits, and exacerbate the threat of a “benefit cliff” wherein low-income families lose their food assistance if their earnings increase slightly. Currently, so-called “Able Bodied Adults Without Dependents” who are aged 18-49 must work at least part time, and, if unemployed, may only remain on SNAP for 3 months. Research suggests work requirements don’t have a meaningful impact on employment outcomes, and the added burden of documentation and paperwork can threaten benefits even when a household is meeting the requirements. Even though these rules claim to target childless adults, they often have harmful spillover effects on children. This draft Farm Bill would strengthen and expand this ill-informed policy. It introduces a new unified work requirement: individuals aged 18-59 must either work or be in an approved training program for at least 20 hours a week, and individuals who have children older than 6 are no longer exempt. Making matter worse, the bill would limit the ability of states to waive these requirements (for instance, to protect vulnerable populations like youth aging out of foster care, or in regions with high unemployment rates), while also requiring them to develop expensive training programs and tracking systems. More than two-thirds of the children on SNAP are school-aged, and these proposals could be devastating for them. Parents who work will now face additional burdensome documentation requirements, which could have a chilling effect on participation. Those who have struggled to find adequate employment, or who can’t afford childcare, may lose benefits. Not only will this mean less food on the table at home, but many school aged children receive school meal eligibility through their family’s SNAP participation status. If kicked off the program, they may face additional barriers to accessing healthy, consistent meals at school. Many of these SNAP policies are presented under the guise of promoting work and encouraging self-sufficiency, but the reality is that families, and especially children, must have their basic needs met. 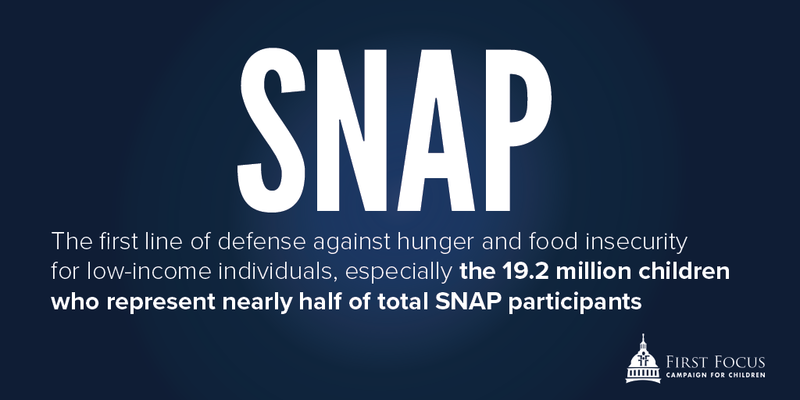 If enacted, the above proposals would seriously impede SNAP’s ability to fight hunger and lift children out of poverty during their critical years of development. Lawmakers instead should use the 2018 Farm Bill reauthorization as an opportunity to strengthen and protect SNAP, so that low income and food insecure children have every available tool they need to succeed.